Fed pause lifts markets. Following Fed Reserve decision to maintain status quo on key policy rates, the Indian markets rallied closing over 1 per cent higher on Friday. The rally was further triggered hoping the RBI may reduce key policy rates. Mumbai: Following Fed Reserve decision to maintain status quo on key policy rates, the Indian markets rallied closing over 1 per cent higher on Friday. The rally was further triggered hoping the RBI may reduce key policy rates. 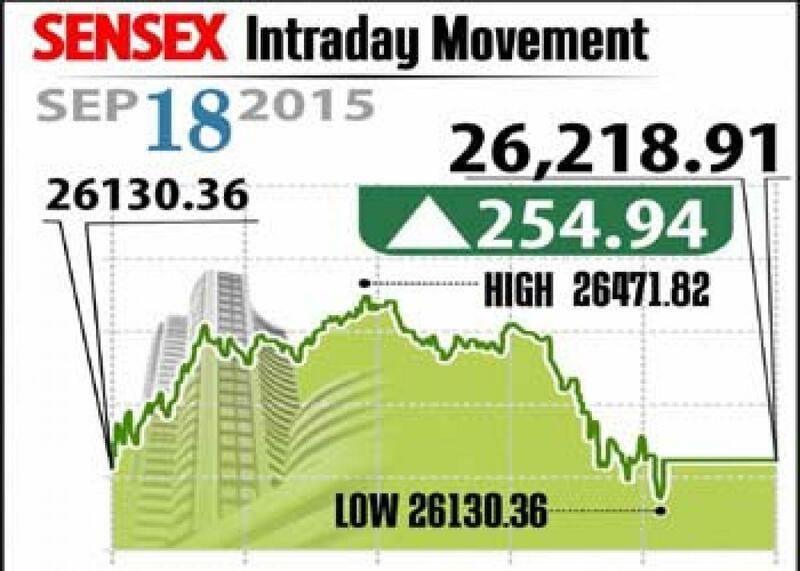 Sensex closed up 255 points at 26,219 and Nifty ended 83 points higher at 7,982. The broader markets also gained in tune with the market sentiment with midcap and smallcap gained up to 1 per cent each. Market assumed that the Fed decision to delay rate hike would benefit India, which can cut interest rates and rises pressure on the RBI. All rate sensitive stocks gained on the premise that the banking regulator would cut the rates in the next policy meet. While Japan and European shares were reported with declining trend, Asian markets closed with marginal gains. On the sectoral front, all the sectors closed in green excepting FMCG and capital goods. The private banks are the top gainers with Axis Bank up 4.7 per cent, followed by HDFC Bank, ICICI Bank and SBI, beside mortgage lender HDFC gaining 1.5 per cent. Among the heavyweights RIL up 2.6 per cent, Maruti up 1 per cent, while Gail down 1.1 per cent. Coming to local shares, Granduls up 4.6 per cent after the company reported getting nod from FDA for Ibuprofen tablets. On the other hand, SKS Micro down 15.5 per cent as it was un successful in obtaining small bank license. The gainers: Axis Bank, up 4.70 per cent at Rs 517.30, ONGC, up 3.49 per cent at Rs 238.60, and Mahindra & Mahindra, up 3.09 per cent at Rs 1,201.60. The losers: Tata Motors, down 2.81 per cent at Rs 328.40, Bajaj Auto, down 2.20 per cent at Rs 2,294.15, and GAIL, down 1.73 per cent at Rs 287.65.